We all hope our lives will count—that in some way we will make an indelible mark within our circles, our society and, perhaps, even beyond. But what happens when a promising young life is snuffed out much too soon? For Mary Woodall the unimaginable loss of her son, Christopher "Chris" Cash, at just 20 years old was almost more than she could bear. However, Woodall has discovered that the difference she’s made in the 24 years since her son's passing has given his existence longevity and meaning that will continue to reverberate for years to come. Cash went to the school’s infirmary. After a CAT scan, doctors shared that he had some type of tumor in his brain. Woodall decided to drive to Cullowhee to bring Cash home to Durham where he could be seen by a specialist at Duke. However, while coming down the mountain on their way home, Cash’s piercing headache worsened and he began to vomit. Distressed and full of fear, Woodall made a detour, taking her son to nearby Wake Forest Baptist Hospital in Winston Salem. Doctors suspected Cash’s tumor was glioblast oma—a deadly and highly malignant tumor in which cancer cells reproduce rapidly. Woodall’s son underwent surgery to remove the tumor. It was then that neurosurgeons confirmed the tumor was indeed glioblastoma. Wanting to get him closer to home so he could get the best care possible, Woodall and Cash’s stepfather arranged for their son to see Henry Friedman, MD, a world-renowned neuro-oncologist at The Preston Robert Tisch Brain Tumor Center at Duke. Glioblastoma is challenging to treat as these particular tumors consist of many kinds of cancer cells, some of which respond better to some therapies than others. Often, treatment includes multiple approaches. Friedman immediately admitted Cash to Duke Medical Center where he underwent intense chemotherapy for several months. Over the course of the next year and a half, Cash experienced multiple rounds of chemotherapy, radiation, a bone marrow transplant and two surgeries. Even though oncologists unleashed every treatment strategy at their disposal, Cash succumbed to his cancer on May 16, 1994—18 months to the day of his first surgery and just nine days before his 22nd birthday. 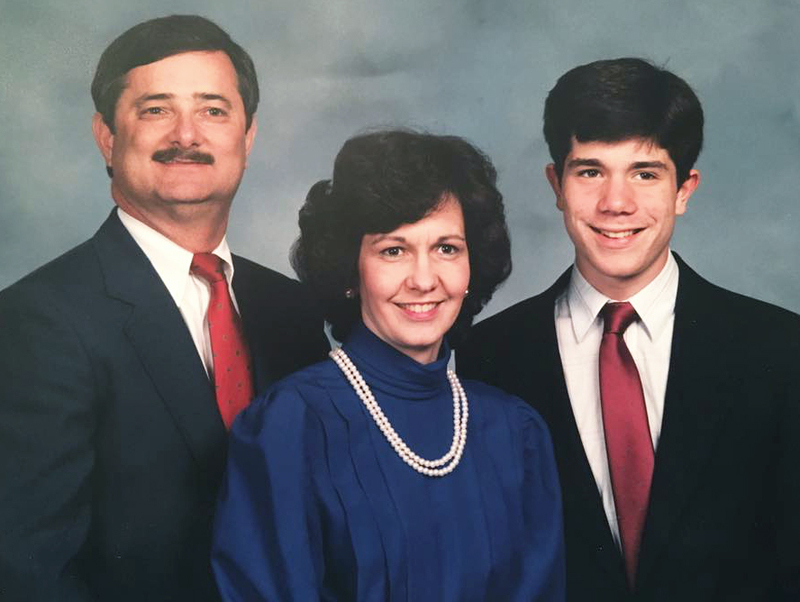 Two years after the devastating loss of her only son, Woodall, an administrative assistant with the History Department at the University of North Carolina at Chapel Hill, found herself just going through the motions. She quickly discovered that the day-to-day demands of life never seem to waver—no matter how great the loss or excruciating the pain. Despite her grief Woodall and her husband continued to fundraise for the brain tumor center’s annual 5K run and walk event. The center’s first event, then known as the Duke Forest 5K and Family Fun Walk, was held a month before Cash’s passing. Although frail and in a wheelchair, Cash had given his all to the fundraiser, which collected funds to support cancer research conducted by physicians and scientists with The Preston Robert Tisch Brain Tumor Center. Enlisting his Sigma Nu fraternity brothers and their contacts, his team, Chris Cash, raised more than $9,000 toward the event’s $27,000 total that year. Event organizers dedicated the second annual event to Cash. Woodall, who had also gotten involved with the brain tumor center’s Parent Advisory Counsel, signed on to help organize the 3rd annual event, hoping to help the fledgling event grow. And, grow it did. 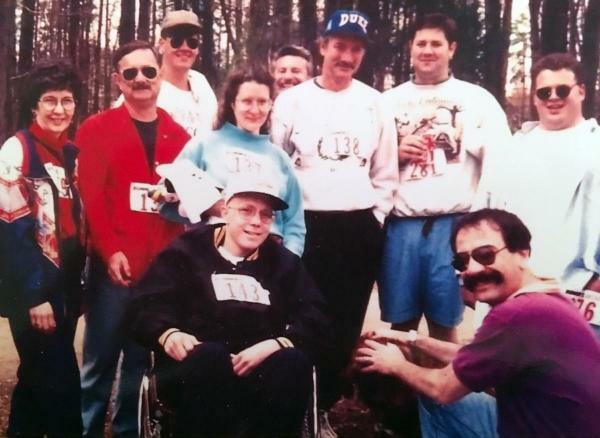 Now 22 years later, the event, renamed in 1998 the Angels Among Us 5K and Family Fun Walk, is organized by The Preston Robert Tisch Brain Tumor Center, for which Woodall served as an event coordinator for more than two decades—11 years as a volunteer and 12 years on-staff. The event attracts participants from across the country and raises about $2 million each year—$22 million over its launch 25 years ago. For Woodall, who has supported and helped plan the event every year throughout its history, it has been a means for giving purpose to Cash’s legacy. Although she plans to continue fundraising for team Cash-Dennis and Angels Among Us, Woodall will step down this year from her position as event coordinator, a stint she believes has been, at the very least, been therapeutic. The 2018 Angels Among Us 5K and Family Walk takes place Saturday, April 28, at Duke Medical Center Campus in Durham, North Carolina. To learn more or to register, visit AngelsAmongUs.org. To honor Cash and to celebrate Woodall’s 25 years of service to Angels Among Us, please donate at Team Cash-Dennis. 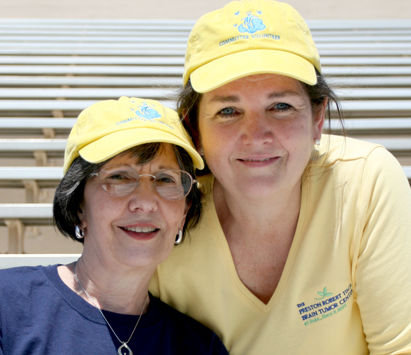 Above Circle Photo: Mary Woodall takes a break from her duties organizing this year's Angels Among Us 5K to pose with Ellen Stainback, director of external relations for The Preston Robert Tisch Brain Tumor Center. The duo has worked together for more than two decades to put on the annual fundraiser. "Mary is truly an angel among us," said Stainback. "She has been devoted to helping raise funds for brain tumor research at Duke since the day Chris was diagnosed. Mary has worked tirelessly for 25 years so no other family would have to endure the pain of losing a child. It has been an honor and privilege to work alongside Mary, who has become much more than just a 'partner in crime.' She's a wonderful friend."